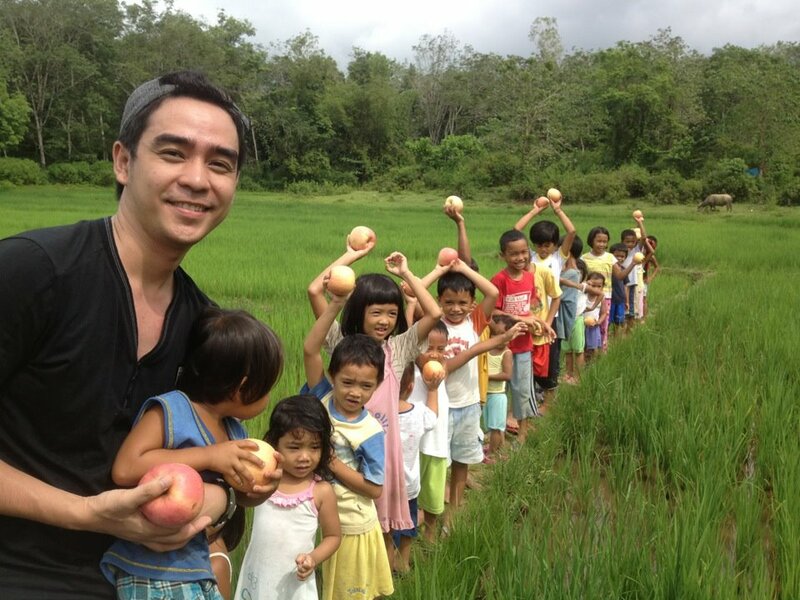 Being a Young Social Entrepreneur « The Appledrive Project Inc. I wasn’t always just your average “Appleboy”. I’ve had my fair share of experience in joining the rat-race we called employment. Like most idealistic college graduates, one has many hopes, and aspires for many ideals and dreams, one which we believe we can achieve once we are earning on our own. While this might be true for some, I wasn’t quite satisfied with just receiving my salary every 15th. I wasn’t satisfied with the thought that I would be doing that for the rest of my life. So an idea sparked in my mind. I started saving away my salary every 15th. My inspiration as a budding young entrepreneur probably started back home with my father’s own bakery business. As a kid, life was a bearable. But with my father’s perseverance and industry, together with another buying and selling enterprise on the side, he was able to provide us with a relatively comfortable life. I believe that that childhood experience planted a seed somewhere in me to never just be satisfied with the status quo. When I started working in Manila for an international charitable organization, it opened my eyes to the real current plight of poor kids in the Philippines, especially in the remote provinces: kids going to school with only those thin “sando bags” (plastic bags) as “bags” so they would have someplace to put their school things in; them not being able to eat healthily, simply because their parents could not afford to prioritize this kind of need for each of their kids if there would be more than five mouths to feed at any given time. It was disheartening to see these kids whenever we went around the different parts of the Philippines. Because of this, together with my good friend, Josh, we decided that if we want to make a lasting difference in the lives of these young kids, and the future generation, we must create something impacting and sustainable. Out of this idea, BAG943 was born. BAG943 stands for “Be A Giver.” It is a mission-driven business that integrates social responsibility by practicing a “Buy One. Give One” culture through its social arm called BAG OF DREAMS Project. It has a simple concept. For every BAG943 purchase, another bag is given to an impoverished child from its pool of adopted public schools in the Philippines. The BAG OF DREAMS Project goes on a bagdrive and distributes bags at least every quarter through the help of its volunteers. On its first year, BAG943 has given over 1300 bags in 11 public schools. 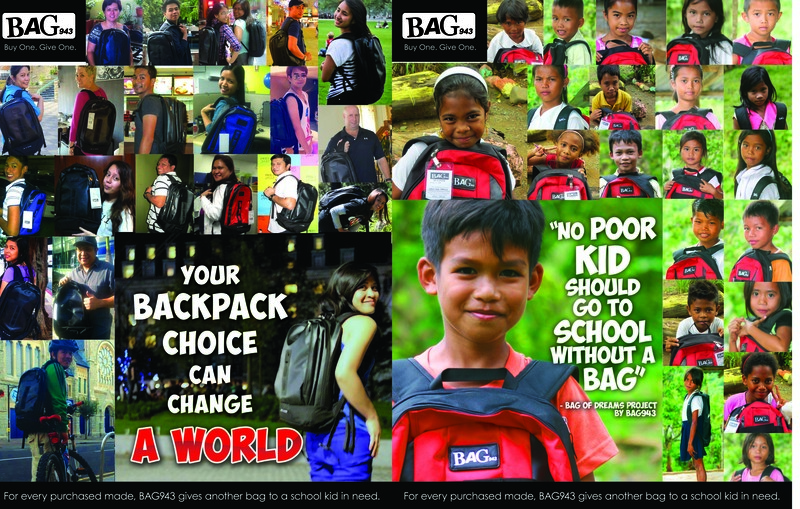 Our vision at BAG943 is to be the ultimate bag brand of choice with a mission to give as many schoolbags as possible, to champion education and to create a culture of generosity among its partner buyers, volunteers, and its beneficiaries. With this renewed heart and purpose, my partner, Josh, and I decided to leave the jobs we had then, pooled what funds we had to build on this venture. It was not an easy, walk-in-the-garden journey, to say the least. Entering a market with many, more known competitors was no easy task. But that saying, “Go lang ng go!” kept me–us, going. Faith, really supportive friends and their involvement in this, and sacks of determination, paved way for us to reach the goal of blessing at least 1000 kids by our first year anniversary. More than anything, it was really a team effort. Entering into a business venture could not have been sustainable by merely the efforts of just its founders. As with any start-up companies, this was very true for us. We have been very blessed and honored by all our generous Givers and Volunteer partners not just in the Philippines, but all over the world. We have dedicated associates in countries like Singapore, Japan, the United Kingdom, and United States. And here in the Philippines, we have some of the best and most delightfully talented and enthusiastic team! We simply couldn’t be thankful enough. Along the way, we have met a lot of new friends and widened our networks and horizons. We have entered into partnerships, explored different avenues that help us continuously innovate to reach more customers, and help more kids, and employ different strategies to help further BAG943 and the BAG OF DREAMS Project’s cause. In a couple of more years, we hope not only to bless the kids here in the Philippines, but hopefully also the other kids in nearby developing countries as well. And we know that this will not be possible without all our partners’ trust and confidence in what we do. On top of this, I personally enjoy doing my Appledrives, if it still isn’t quite obvious by the name of this site. It gives me a peculiar sense of joy to share the apple love to the kids I meet. As I’ve said, parents of poor families here don’t tend to focus on the health aspect of kids because what is important for them is to get their family through the day with whatever food may be available, even if it may be unhealthy. Rooting on the same problems, the Appledrive component of what I do focuses more on the health aspect of these kids. While knowledge is power (focus of BAG943 on education), health IS wealth. And promoting this will hopefully raise more consciousness not only to these marginalized families, but also to those who are able to share their kindness and blessings to others. The best part of all these? I get to travel. I love travelling! I like that I am able to do that while I do what I love doing. I also love the fact that by helping others, you not only make others happy, but you learn from the experience as well. It definitely makes for a better world. And wouldn’t it make you happy to know that perhaps somewhere out there, what you are doing matters to someone. It may not change the world, but what you are doing can change a world. It has, and it continues to be an everyday journey, to be where I am today. I Iive my decision with no regrets; I feel I can reach out to more people this way. I know I can truly say that I am proud of where I am now, and all because the Lord has made it possible. I’d also like to thank some people who have been great influences for young social entrepreneurs like me. Mr. Boris Joaquin. One of the country’s top-ranked speakers and trainers for leadership programs and other soft skills, he is a seasoned management and marketing professional. 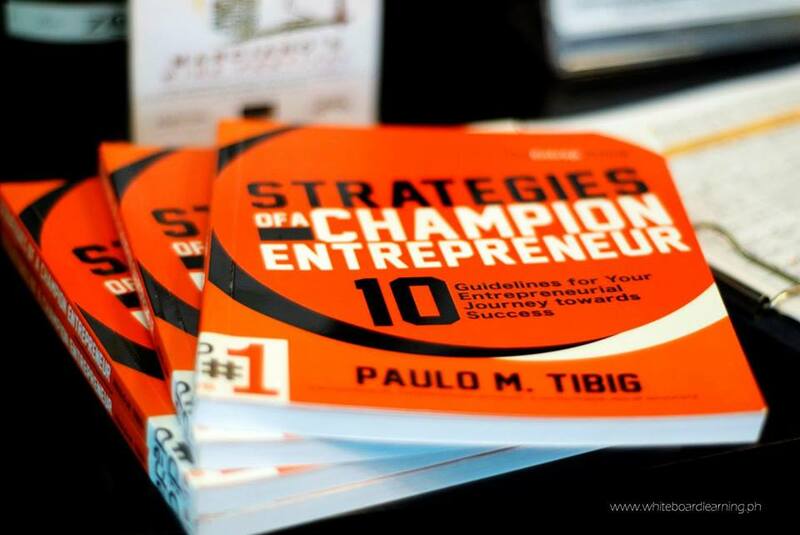 Also, currently reading this amazing book by Mr. Paulo Tibig, he is a champion entrepreneur, professional speaker and entrepreneurship advocate. 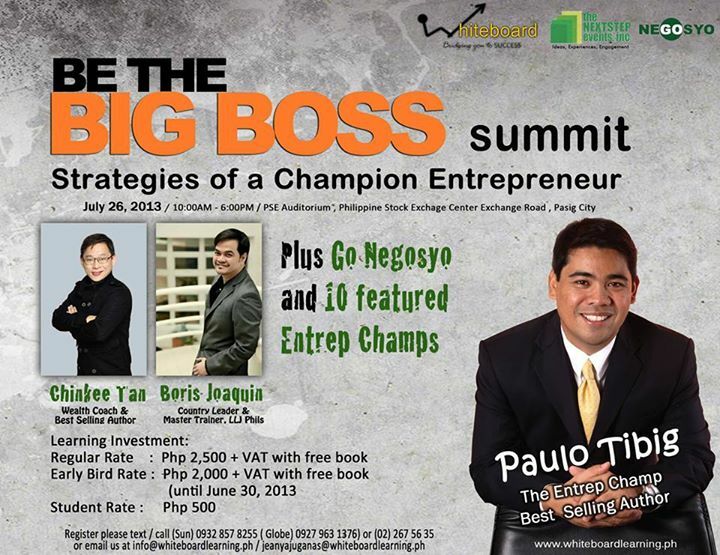 He will also be having the “BE THE BIG BOSS SUMMIT” Strategies of a Champion Entrepreneur this Friday, July 26, 2013, together with Mr. Boris Joaquin and Mr. Chinkee Tan.